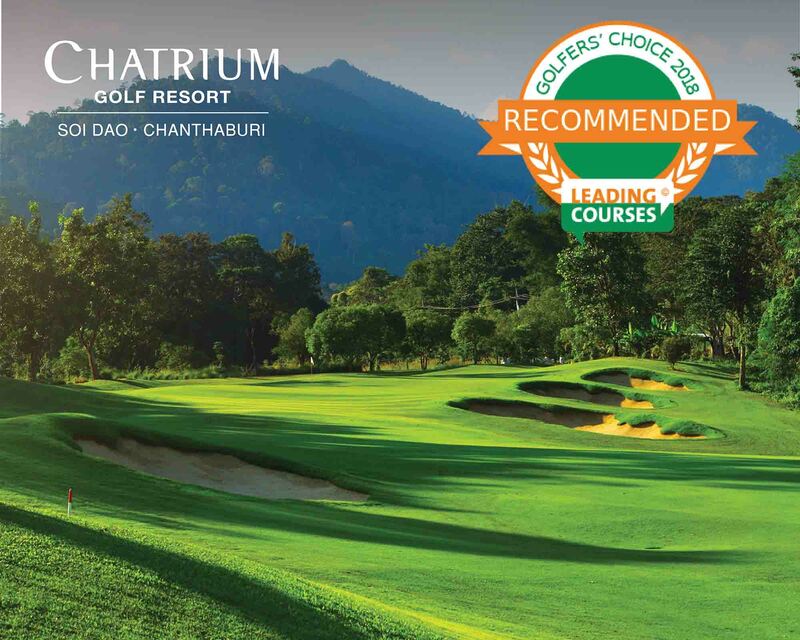 Chatrium Golf Resort Soi Dao Chanthaburi is thrilled to have been awarded the Golfer’s Choice 2018 Recommended Certificate by LeadingCourses.com. Only golf clubs with enough reviews on LeadingCourses.com qualify for consideration, and only those with a rating of 7.5 or more out of 10 are awarded the certificate. Winning this award, Chatrium Golf Resort Soi Dao Chanthaburi has demonstrated once again that it is one of the best golf clubs in Thailand. Chatrium Golf Resort Soi Dao Chanthaburi comprises an expansive 18-hole golf course and deluxe 4-star hotel adjacent to Soi Dao Mountain, set in over 1,580 acres of lush greenery and fragrant tropical gardens of unparalleled natural beauty. This breathtaking highland sanctuary is ideal for friends, family, business associates and groups to discover and explore. The highlight of our resort is the award-winning 18-hole golf course, created by renowned course designer Denis Griffiths. Stretching over 395 acres of lush, tropical mountainside beauty, this undulating course is a challenge to the seasoned golfer, yet more than enjoyable for those seeking a relaxing round of golf. The expansive Club House overlooks the golf course with commanding floor-to-ceiling windows. Here you’ll find our Pro Shop, with all the golfing essentials. Guests can also arrange private parties, group retreat workshops or any other event you have in mind at the Club House. Through the Club House doors, an outdoor terrace and garden provide a beautiful location for garden parties and events.